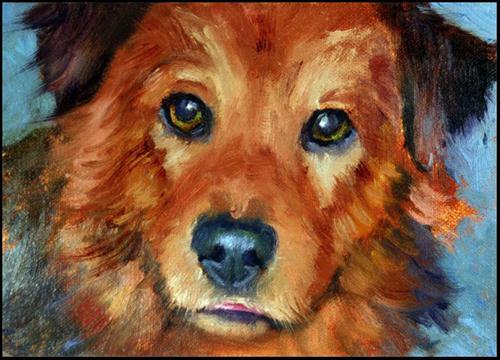 To enter to win Carole Mayne's painting, "Not Here... Here!" 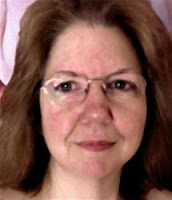 go to go to Daily Paintworks and click on the link at the top of the page announcing Carole's interview. 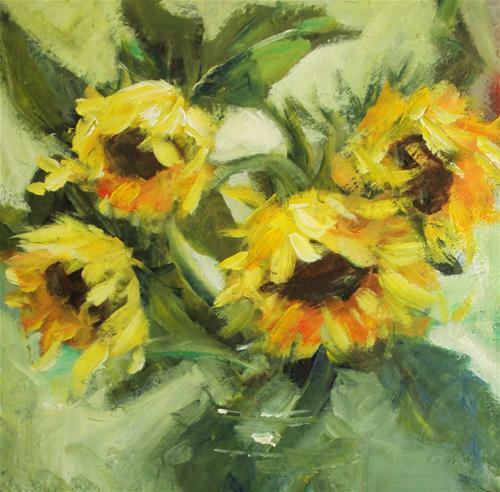 ​Carole Mayne has been painting in oils since she was 15. She attended college briefly and then searched for mentors and studied directly with many notable masters. Tell us a bit about how you first started painting. 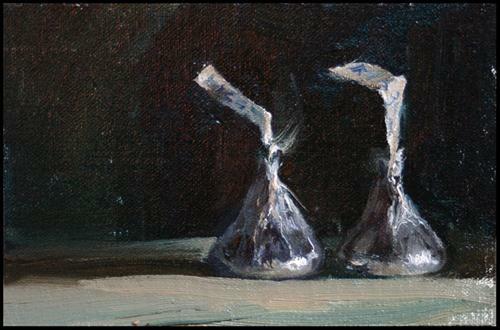 Did you have any stops and starts in your painting career? I have been painting in oils since I was 15. Although I've had to support my painting career with other art-related endeavors, I've never abandoned it for any length of time. Enter to win by clicking on the link at the top of the home page announcing Carole's interview. My first love has always oil painting. I have had superior teachers along the way and began painting in the style of the Old Masters in my 20's, with monotone underpaintings, glazes and scumbling in a very tight, photo-realistic manner. I worked this way for many years, then found I wanted more expression and personality to my work. 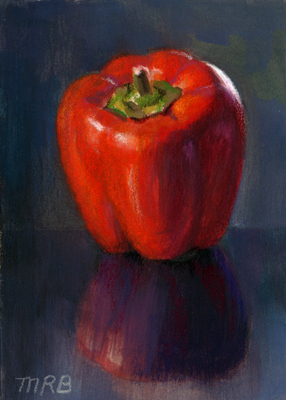 My most significant teacher, Sebastian Capella, taught me alla prima painting and color theory. I also have a great love for art glass and built leaded glass windows for decades. I have a kiln for painting and firing porcelain tile and glass. I still design stained glass windows for a few designers. I am now painting with transparent oils and mediums for my underpaintings with an alla prima layer on top, with thanks to Dreama Tolle Perry. It's almost the exact reverse of the way in which I started painting in the Old Masters' style! Which mediums and genres are you looking forward to exploring? There is such a dreamy, ethereal quality to your work. 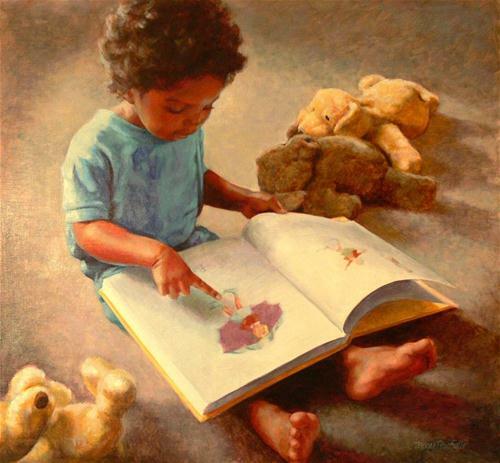 What can you share with us about what you're drawn to painting and the feeling that you want the viewer to experience? Thank you! I love the quote: "Painting is a collaboration between God and the artist and the less the artist has to do with it, the better." When beauty flows through an artist, it goes through the viewer, too. 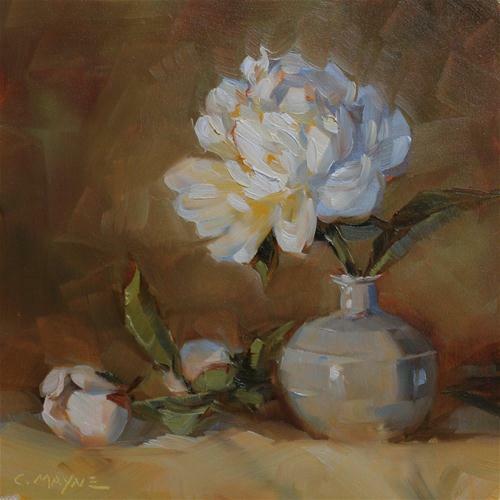 It's a wonderful challenge to make the object of a painting about the light and shadow patterns and let this introduce the subject, then there is depth or drama or color that keep the viewer's interest. Procrastination comes from perfectionism and I learned early that's not something I could afford to indulge in very much. 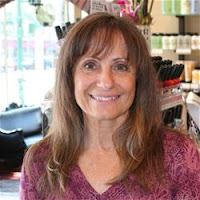 I have been self-employed and worked from my studio my entire life, while being home to raise two daughters and spend time with our grandsons. I have kept my life simple and treasure the day light hours to paint in. I don't beat myself up for choosing other activities that have provided me a balanced life, which is very important. 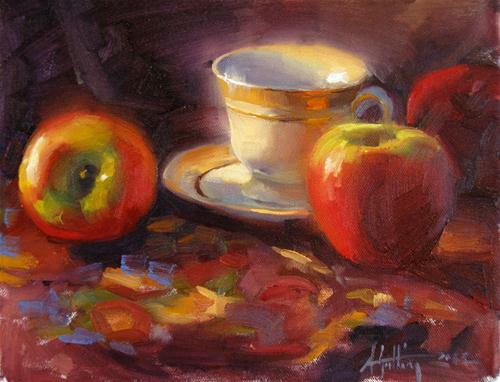 I am more naturally drawn to dramatic landscapes, skies, flowers, and sunlight and the main themes or concepts should be thought out first, no matter how simple they may be; if it's an apple--what about the apple is worth elevating? My interest in a variety of subjects never lacks and I have been on an amazing journey with fabulous mentors and teachers in this life. I've been to Italy seven times and find endless inspiration there. My quest has been to follow the footsteps of the great teachers and painters and ultimately make my own work my favorite! My husband and I are going to Thailand next March and I have loved to travel with my pochade box around the world. I am learning to be a clearer 'conduit' for beauty, harmony and light. I am so grateful to be able to do what I love. 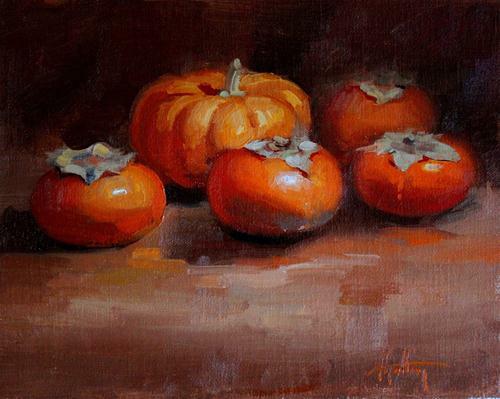 To enter to win Abigail Gutting's painting, "Fruit of Autumn," go to go to Daily Paintworks and click on the link at the top of the page announcing her interview. Abi is a full time artist by day and an art instructor by night, working with children and teenagers. Her students are award winning young artists. I've been drawing and painting for as long as I can remember! When I was little, my mom, artist Susan Gutting, would work at her drawing table in the afternoon while my brother and I were down for naps. I would get up early, slip into her work area, and she would make room for me at the drawing table and we'd "work" together! She studied at the American Academy of Art in Chicago and has been my primary instructor throughout most of my childhood. Enter to win by clicking on the link at the top of the home page announcing Abigail's interview. Starts and stops... not really! I've been pretty focused on developing my skills since day one. During my high school years I was focused more on music (classical piano and singing), but never stopped pursuing fine art. When my high school work was done, I cut back on everything except fine art. I've been oil painting for 8 years. Before that, I was primarily a colored pencil/ watercolor artist. I was pursuing a career in children's book illustration until one year the Oil Painter of America National Show came to Seattle. After spending a day in the presence of so many professional oil painters and being surrounded by such incredible work, I started oil painting and never looked back! And right now I have no desire to move on to anything else. There is so much to learn about this medium... it never grows old! 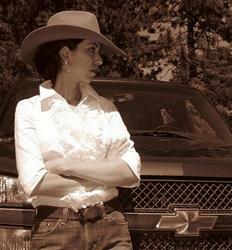 Your subject matter runs the gamut from classic Western features, to warm and evocative portraits, to quiet still lifes. What's it like transitioning from one to the other and making sure you do each subject justice? Transitioning between subject matter... hmm. It's never been a challenge to switch back and forth, mainly because it all interests and inspires me! The advice for artists is usually to avoid such a wide range of subjects, but I love it all. My goal is to tell a story with my work that enables people to dwell on what is lovely and wholesome. I'm very guarded with my painting time. Because it's such a solitary endeavor it's easy to let things slide. To avoid that, I've treated it like a 9-5 job for the last several years. I like to have my paintings planned out ahead of time, so when one is finished I move right on to the next one without delay. I photograph rodeos all summer long. I plan photo shoots with models, both human and animal. I'm always gathering items for still lifes. I have model sessions in my studio, so I can paint from life. I plein air paint with my mom (who is the landscape artist in the family), so I can apply those studies to my studio paintings. There is never just one source for my ideas... they come from all of life! How do I avoid burn-out? 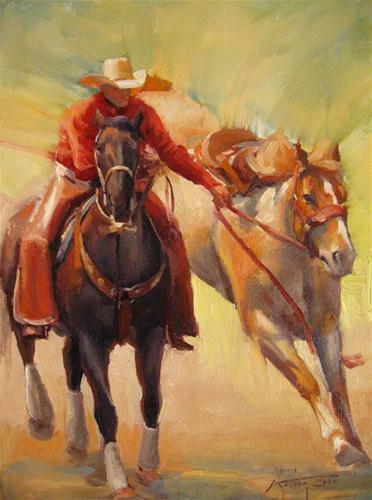 Well, one of the workshops I've taken in the past was from Bruce Greene, Cowboy Artist of America at the Scottsdale Artist School. He emphasized throughout the class that the pursuit of excellence in art should be kept in it's place. There is a time for everything and I think part of being disciplined as an artist is knowing when to call it quits for the day. Family comes first. Friendships are invaluable. This, along with all the other "stuff of life" enriches and inspires me when I come to my easel everyday. The same principles over and over again! Value, color temperature, composition, accurate drawing, etc. Each new painting is a lesson in applying these timeless theories. Seeing others enjoy it! I believe that is the purpose of an artist... to portray the beauty of Creation to other people. 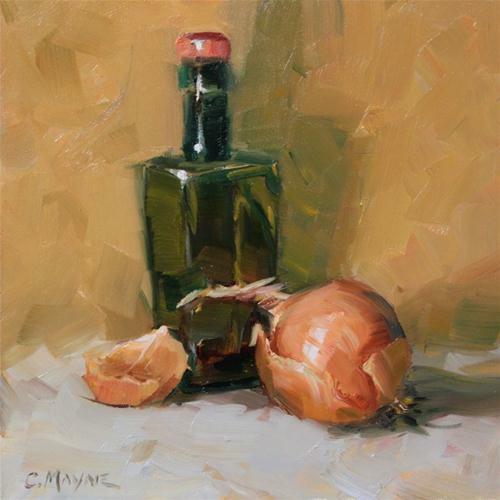 To enter to win Judith Cameron's painting, "Brown Onion #3," go to go to Daily Paintworks and click on the link at the top of the page announcing her interview. 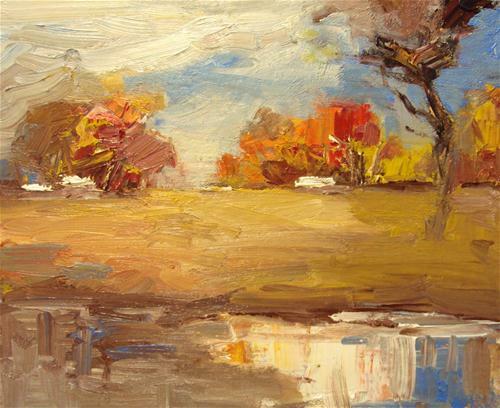 I have been painting primarily Plein Air landscapes since 2004, although I pursued other media in college. In 2009, inspired by this very group, I began what turned out to be "Every Few Days Paintings," incorporating still life into my body of work. In 1981, when I was already in my 30's, I completed my B.A. in Art with an emphasis in Etching and Ceramics, but I never really went anywhere with it. Fast forward to 2001, when I decided I wanted to learn to paint. I enrolled in a school here in Southern California called "Mission Renaissance," which was started by Larry Gluck, a graduate of the Art Student's League in NYC, the curriculum and approach of which serve as the foundation for the teaching of this school. After 2 1/2 years studying there, I joined a local plein air group in 2004 and have painted with them ever since. I started a Daily Painting blog of my own in 2009 and "graduated" to being a member of DPW last year. Enter to win by clicking on the link at the top of the home page announcing Judith's interview. Well, I suppose you could say that the period between 1981 and 2001 was one big "stop." 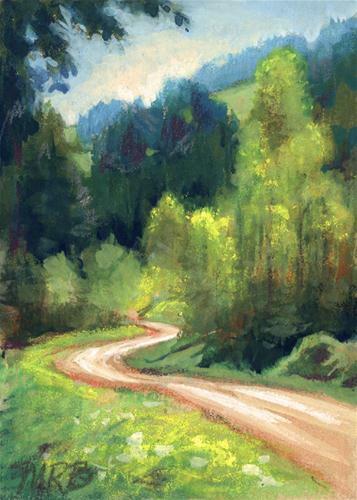 The decision to go to school to learn to paint was a huge decision, as was joining the plein air group. But for all 30 of those years, the need to be creative, to be doing something, was constantly prickling at me. It was a revelation to have finally found what I wanted to be doing. With the plein air group though, I found I was only painting for specific upcoming shows, with lots of down time, or stops, in between, and with nothing from myself pushing me to get out and paint. At some point I became aware of the Daily Painting phenomenon, and decided to start my own blog. I've never been able to manage an actual painting every day, but just being able to get two done per week keeps me from stopping any more. I've painted with oils right from the beginning. Because of my earlier art background, I was familiar with all the other usual media: watercolor, acrylic, pastels, etc., and knew from those experiences that oils were for me. I love the intensity of color, and the forgiveness of the medium. I don't think of myself so much of a genre painter as someone inspired by specific artists. 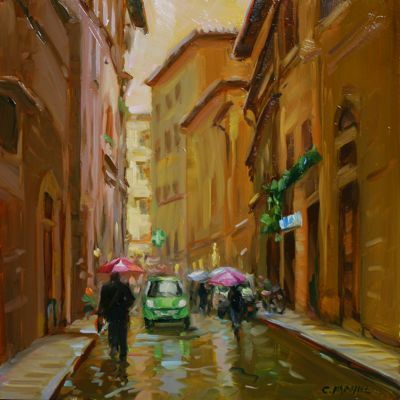 John Singer Sargent, Richard Schmid, Cyrus Afsary, Julian Merrow-Smith are all artists whose work I obsessively look at. I would say I'm a realist painter, but I love to see lots of paint, and broken color, and beautiful, deft brushwork. I'm most attracted to paintings that can use abstract textures, to suggest and define realist subjects. As for future media, right now I'm still too in love with oils. I love the classic beauty of your still lives, pet portraits and sunny vistas. What's most important to you about what you're trying to capture in your subjects? An emotional response to light. That is the first thing that pops into my mind. The thing I respond to in any subject, landscape or still life is light. I spent the 90's as a professional photographer, chiefly photographing other peoples art work, as well as photographing gallery exhibitions for catalogs. I learned a lot about light, and I still see my subjects in those terms. 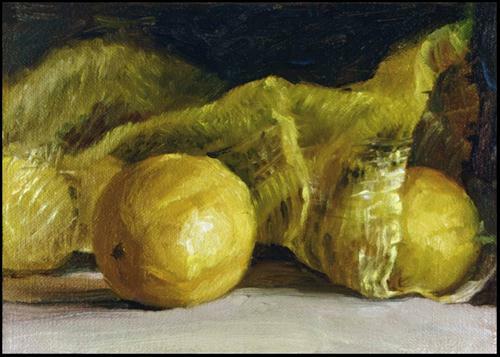 Most of the time, I set up my still lifes thinking more about the light and the mood it sets, than the object itself. Actually, the Daily Painting phenomenon was a godsend. As I mentioned above painting landscapes, I tended only to paint for upcoming shows and I still do that actually. That's why having my own blog and joining DPW has been such a help. 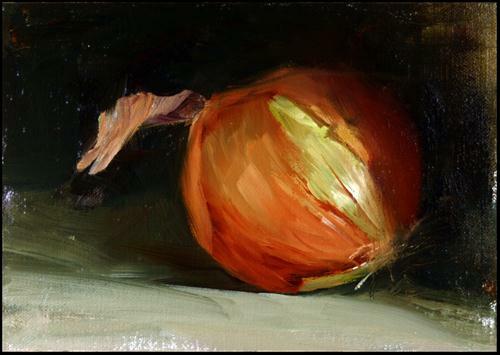 It's much easier to go up the stairs to my studio to paint another onion, than to load up all my gear, and drive out to a likely scene to paint. DPW is the perfect procrastination buster. And it doesn't hurt to have a blog with people signed up to receive a painting in their inbox. It gives me an external obligation that short circuits my own inertia. Also, as I am retired, my household obligations are few. I know that that is a huge advantage. To all of you artists with young families - I don't know how you do it! I just rely on that quick instant when I see an object, or a scene in a certain light. Or, I find myself passing something by week in and week out, thinking,"How would I paint that?" I'm a very literal painter; in fact I find it difficult to make stuff up. So, I'm very engaged with what I see. Also, other artists choose amazing things to paint, so I look at their ideas and see what I can do with the same subject. 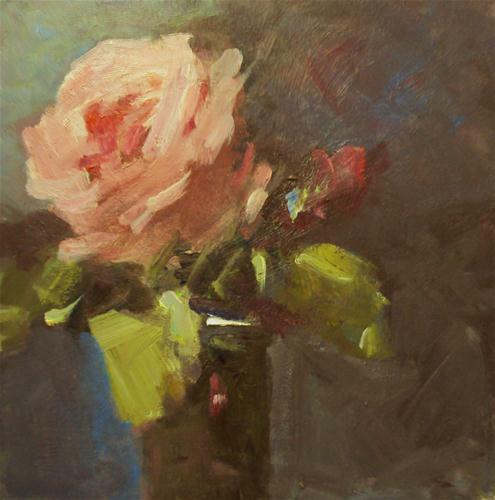 Duane Keiser's work is a wonderful inspiration for subject matter. What to paint has never been difficult, it's more that there is too much to paint. At the market this morning, there were so many onions, and peppers, and garlics I wanted to buy because I loved how they looked, yet I've still got 3 pomegrantes waiting for me to do something with too. Not to mention the close to 2 dozen onions aging in bowls all over my studio. It's endless. Again, maybe because I've only been painting for about 9 years, I don't feel that getting stale is a problem. I have so much more to learn, in fact I don't think I've arrived at any sort of final level. I am never satisfied, and can see the need to improve in almost every piece I finish. I do try to push myself to try new things: different brushes, different brushwork, new and different approaches like thin paint, thick paint, different palette of colors, different painting surface. I research the materials of my favorite artists to try and understand how they do what they do. This alone keeps me striving and interested. I don't think I'll run out of challenges. I'm currently working on a huge commission, a 36" x 48" landscape, so that means right now I'm learning how to make something that large still look fresh. Mostly it seems to be a LOT more paint. I'm terrified, but also excited. I feel like there are two kinds of happiness for me. One is a task driven kind of happiness, where I can only be happy when I get that sense of the jigsaw puzzle piece dropping into place; that's what it feels like when the values, and the color, and the composition all come together and, "click," I know it's right. That's when I'm happy. If it doesn't click, I'm not much fun to be around until I get back to it and get it right. Ask my husband. The other kind of happiness, is the more lasting, and deeper joy one gets from being immersed in the process of expression. It's the happiness that's easy to take for granted where everything disappears but the brush and canvas and I'm in that wonderful zone of suspended time. 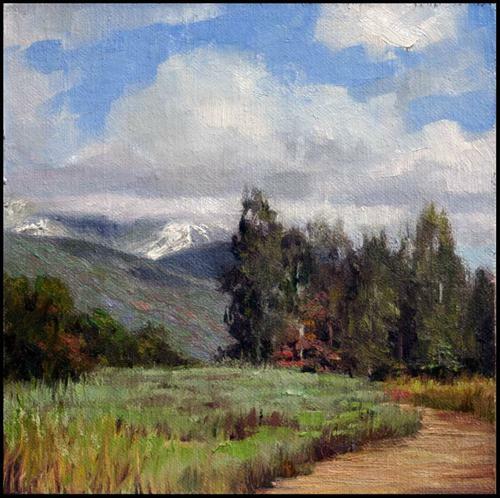 Each week we spotlight a different DPW artist who gives away one of their best paintings. 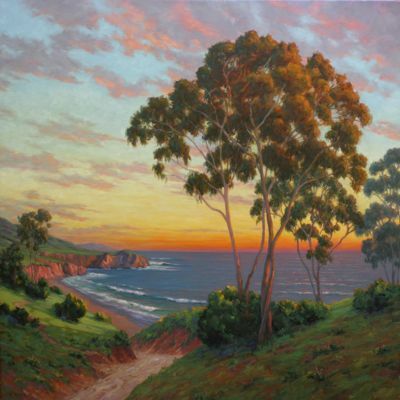 To enter to win Parastoo Ganjei's painting, Catching the Light, go to go to Daily Paintworks and click on the link at the top of the page announcing her interview. As well as exhibiting in many galleries around the United Kingdom, the USA and Europe, Parastoo has sold her original paintings into private collections all over the world. I started painting at a very early age. My grandfather's art had a big influence on me. He was a great painter and his studio was my favourite place with all sorts of beautiful objects to paint from. Every week, my grandfather asked me to show him my new paintings and I loved to hear his opinion about my art. Today I feel the same excitement and happiness when I create a new painting. Enter to win by clicking on the link at the top of the DPW home page announcing Parastoo's interview. I have been painting all my life. 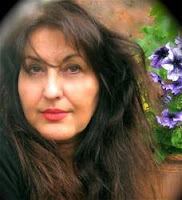 From childhood, I wanted to be an artist and in spite of my parent's persuasion to study medicine, I studied art at the university for four years, exploring fine arts, sculpture and graphic design. Later, I studied animation and illustration, but my real love for painting made me become an artist. While studying at the university, we experimented with lots of mediums and techniques including watercolour, oil, pen and ink, gouache and charcoal. I liked the watercolour and gouache. Later on, I discovered acrylic paints and I found them to be very flexible with such a wide range of vibrant colours, so I carried on painting with them. If I decide to choose another medium I will go for oil. Your dreamy, otherworldly landscapes and luxurious flowers seem to conjure up a particular kind of slow-paced life. 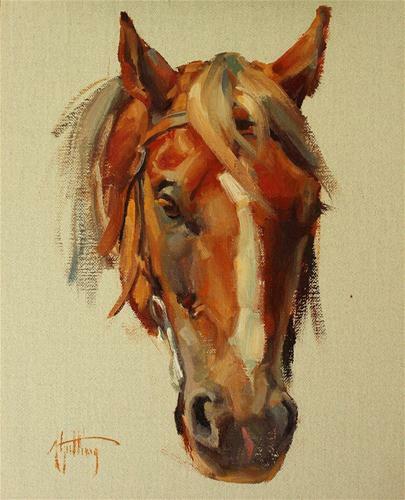 What can you tell us about the feeling you want your paintings to convey? Thank you for your lovely comments. I used to live in London for a long time, a very large and busy city. We moved to a much smaller seaside city on the south coast of the country where I had my first garden. I was entertained by the birds singing on our pear trees and had occasional visits by the foxes. The sea breeze and the noisy seagulls were the constant reminders of living near the sea. When we moved to the country, it felt as I had awakened from a very long and deep sleep. Living so close to nature showed me that the flights of my imagination were limited to scenes around my backyard and now I can zoom into galactic distances to create a new world. I paint my immediate surroundings and no matter how faithfully I render, it will not carry the power to convince if my painting is not presenting a fertile imagination. My remembered, or rather invented, landscapes are more alive than paintings I used to do on the spot. Now I think it is not faithfulness to the scene before me that presents the sense of reality; it is my inner consciousness and my feelings which gives life to my paintings. 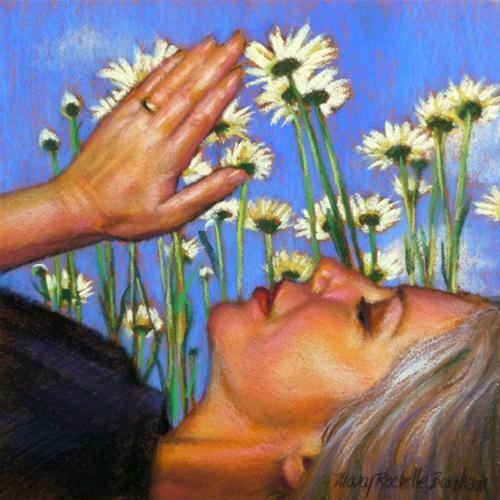 I want my painting to convey my sense of gratitude and love for life. My art has a very important role in my life. I paint most days and I like to be honest and genuine towards my paintings, so I only paint when I have the desire to paint. At the moment the deep reds and oranges of late Autumn are laying on the grounds of our valley and evergreen pines on their guards against the dramatic sky are so stunning. When winter arrives in thick snow to cover the rugged farmlands and downpours ripple the Wylye River, I will have lots of ideas to paint from. 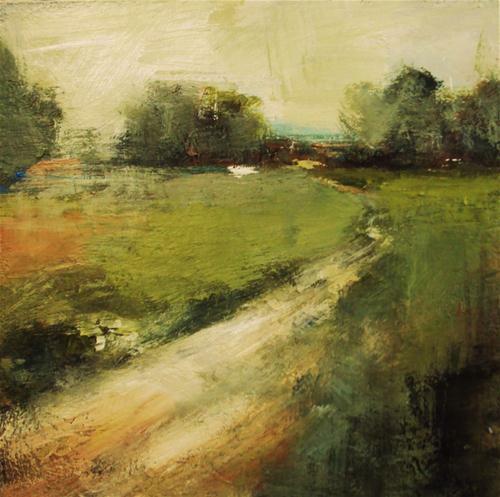 I usually arrive at my idea for a new painting while driving through the country lanes. Where I live is a beautiful and engaging part of the world and painting nature not only has given me the chance to practice the most enviable career as a painter, it has taught me so much about life and how resilient and intelligent nature is. 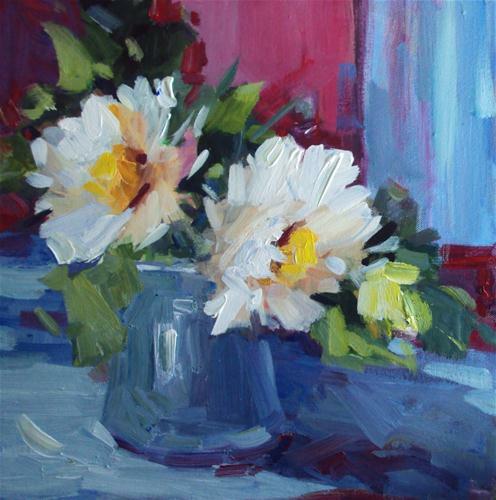 I love to portray atmosphere and movement in both my floral and landscape paintings. My brushwork is loose and I paint fast. I love colours and I use a lot of shades and hues in my paintings. As an artist I like to think that I am learning all the time. I like to observe my surroundings with less emphasis on details and to portray more feelings and emotions in my painting. The fact that I am able to paint and show my paintings to the world makes me very happy. 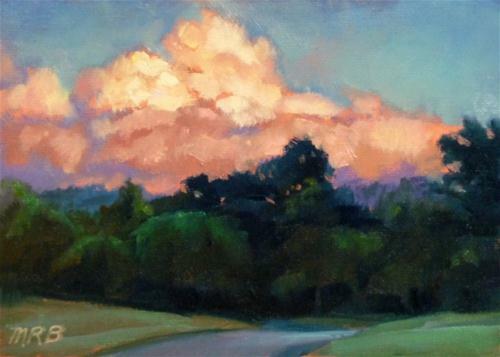 To enter to win Mary Rochelle's painting, "Whip Cream Evening Clouds," go to Daily Paintworks and click on the link at the top of the page announcing Mary's interview. "Like so many others, creating art is my passion. My inspiration comes from all that is around me. I am excited by color, light and form." I was in kindergarten and each day a student was chosen to paint at the easel. One day it was my turn and I secretly thought that when I grew up it would be so wonderful to be an artist. Somehow, in my mind, I envisioned that if I could paint something to look real, maybe it could become real and I would be happy. Well, in a sense, I guess I was right, because I'm so happy to be able to paint what I love and experience the very real feelings that the act of creativity brings to me! 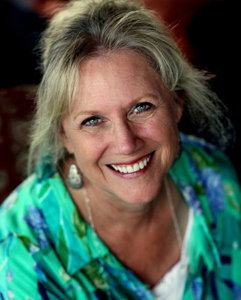 Enter to win by clicking on the link at the top of the page announcing Mary's interview! Yes, there have been some short-term detours. When I was 18, my first job was with the telephone company as an operator and then with directory assistance. I was chosen to do ‘in-house’ posters and other little art assignments. I was asked on numerous occasions, “Why aren’t you out there making money with your artwork and not working for ‘Ma Bell’?” I put myself through college and art school and the rest is history, as they say. 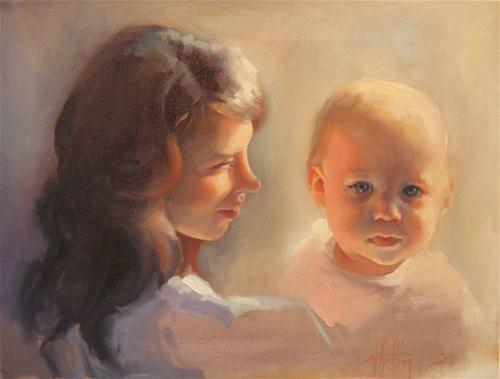 I sold my first portrait at the age of eleven and began my career as a portrait artist. Later, that turned into encompassing caricatures at parties and events, as well as illustration work, courtroom sketching and teaching. I took in plenty of commission work and sold my fine art at every opportunity. I became skilled at pastel, oil, acrylic, gouache, pen and ink, watercolor, charcoal, pencil and color pencil. 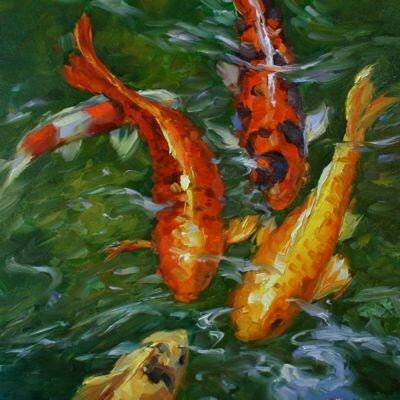 Now, as I am getting older, I am narrowing it down to mainly oils and pastel with the focus on my fine art. There's such a wonderful sense of warmth and richness to your work. Are you classically trained? And if so, how do you manage to bring that extra something to your paintings? Thank you, Jennifer. I attended Wayne State University, where I was in the Fine Arts department and focused on drawing and painting. I earned my BFA from the Center for Creative Studies, College of Art and Design in Detroit, my major being in Graphic Communications. Putting that something extra into paintings cannot be taught. The artist must have a passion and for me it’s the very act of creating art that lights my fire. I want to be good and I don’t settle for mediocrity. However, there is always room for improvement! I would be lying if I said that I never procrastinate. Sometimes, I will just sit and play solitaire... spider solitaire. That is when I am terribly anxious. It gives me a sense of mastery when I win. I fail a lot. But, if I keep believing that I am going to figure it out, I’ll find a way. I sense that every single game is winnable. It’s the perfect analogy for painting, for me. I accept that sometimes I get stuck, overloaded, or just plain tired. I give myself permission to just chill and be quiet with my thoughts. It’s a kind of mediation that not only calms my anxiety, it is fun and relaxing. That being said, I probably put in eight to ten hours a day into doing art, marketing and paperwork. I definitely enjoy looking at other artists work, figuring out what I enjoy about it and trying to incorporate that inspiration into my art. I take lots of reference photos and keep a morgue (reference file). I make sketches and manipulate images in Photoshop. I know that whatever appeals to me today, may not tomorrow. So, I keep everything in files on my computer or in a file cabinet for tangible items. When I feel moved to act, I do so quickly. If I lose the passion, I will put the piece away. I love working from life - the same applies. The idea comes from what I feel compelled by; a feeling, an emotion, a memory. The idea is often the easy part, it's working through all the preliminary work that is a struggle and then the painting often seems to paint itself. I have kept many irons in the fire over the years and I switch up to keep burnout at bay. If I don’t feel like painting, I give myself permission to draw. If I don’t feel like pastels, I paint in oils. If I don’t want to work on fine art, I’ll do caricatures or illustrations. It's all good! It all has merit, teaches me, as well as, gives me pleasure. Easy... all about life... who I am and where I belong. I have made the most wonderful creation of all, my life as an artist, the joy it brings to me and the joy it brings to others! How cool is that?